This guided lodge safari is for Africa experts and culture enthusiasts, who are looking to explore the more unknown parts of northern Namibia. From Windhoek, your journey takes you to a living museum of the San, where you will get an interesting insight into the traditional way of life and culture of one of the oldest inhabitants of Namibia. 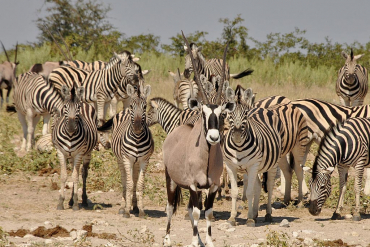 You will explore the fascinating animal kingdom in Etosha National Park, before heading to the Kunene River located deep in northern Namibia. Gaze upon the Epupa Falls and enjoy the beautiful scenery of this oasis-like place. 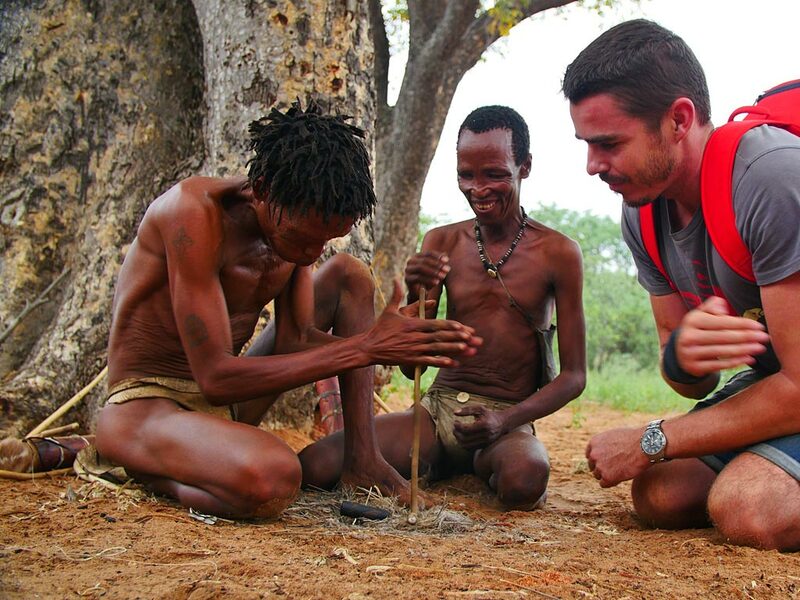 You will head off to a Himba village to learn more about the culture and habits of this semi-nomadic tribe. Via Opuwo, the district capital of the Kunene Region, you will reach Sesfontein. On your quest to find desert elephants you will travel on the rough terrain of the Hoanib Valley in the Kaokoland. 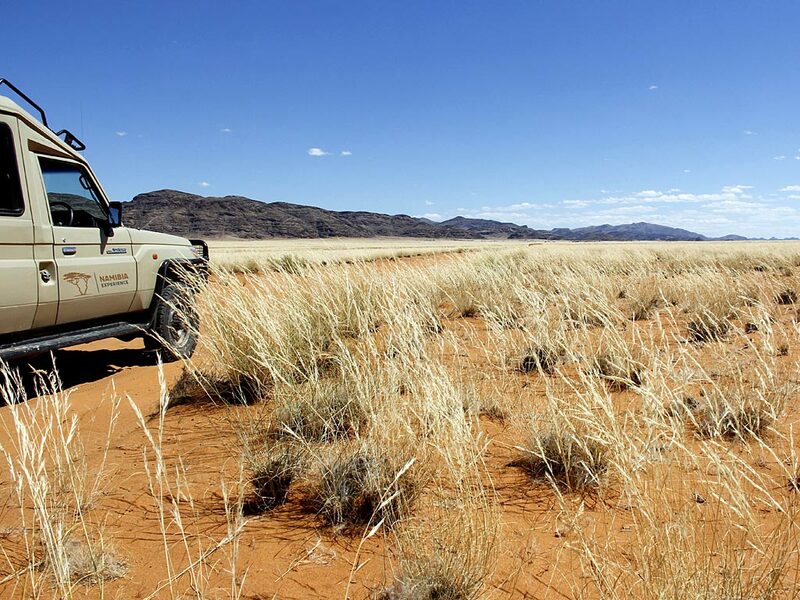 To round off your tour you will visit the unique Damaraland with its peculiar sights, before ending your extraordinary journey in Windhoek. Upon your arrival at Hosea Kutako Airport you will be met by your transfer driver and taken to the Elegant Guesthouse in Windhoek, where you will have some time to rest and freshen up after your long flight. In the afternoon, you will meet up with your guide for a tour of the city. You will visit the Alte Feste (Old Fort) and museum, the Christ Church, the Tintenpalast (House of Parliament) and the former Kaiserstraße, now called the Independence Avenue. In the evening, you can join your fellow travellers for dinner at the well-known Joe’s Beerhouse. After breakfast it is time to head north! Along the way you will pass vast farmlands and the historic Waterberg Plateau, towering majestically over the surrounding flat plains. As you reach Grootfontein, you will take a detour to the Hoba meteorite. It impacted the ground roughly 80,000 years ago and is the largest known meteorite on earth. In the afternoon, you will reach your accommodation for the night, the rustic Roy’s Rest Camp. Today you will visit the Living Museum of the Ju/‘Hoansi-San and embark on a journey through the ages. 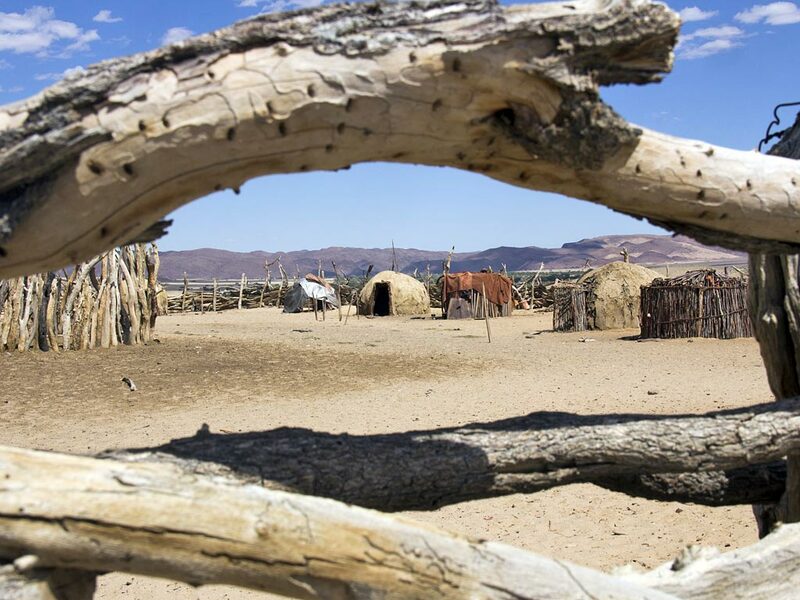 The reconstructed traditional village gives an authentic insight into the past and present lives of the San, one of the earliest indigenous people of Namibia. The San, dressed in traditional garb, bring home their hunter-gatherer culture, their traditions and their way of life in a very interesting way. Try your hand at setting traps, starting a campfire, searching for water and food or archery. After this unique experience, you will return to Roy’s Rest Camp, where you will stay another night. After breakfast you will continue through Tsumeb and along the deep blue Lake Otjikoto, a place where many stories and myths have originated, on your way to Etosha National Park. Your accommodation for the night is situated just outside the park gates. You have some time to relax before your first game drive in the national park in the afternoon. 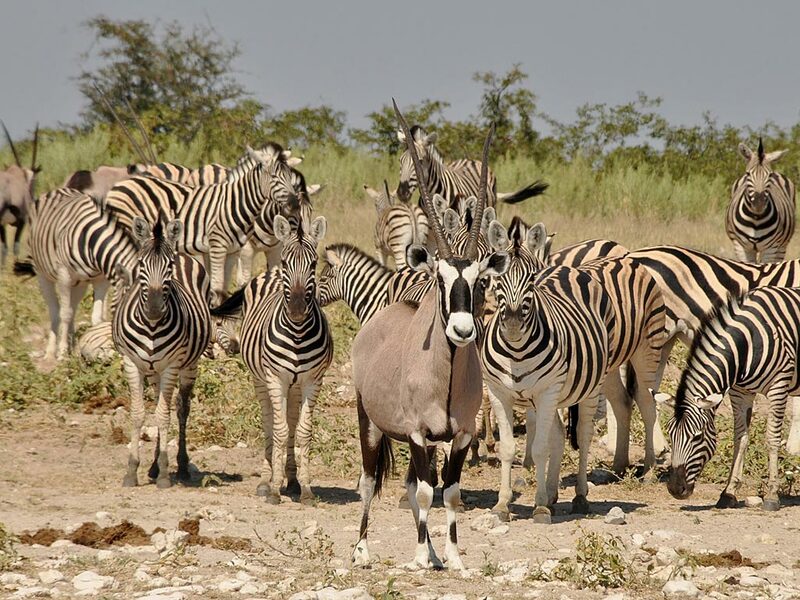 Etosha (‘Great White Place’) is one of the biggest national parks in Africa and with its diverse wildlife and landscape – from Acacia trees on the wide-open plains to the large salt pan, stretching as far as the eye can see – it is definitely one of the most interesting. Keep an eye out for elephants, giraffes, lions, many antelope species and much much more! Sitting around the campfire in the evening you have time to reflect on the events of the day, before enjoying a delicious meal. You will stay the night at Mushara Bush Camp. 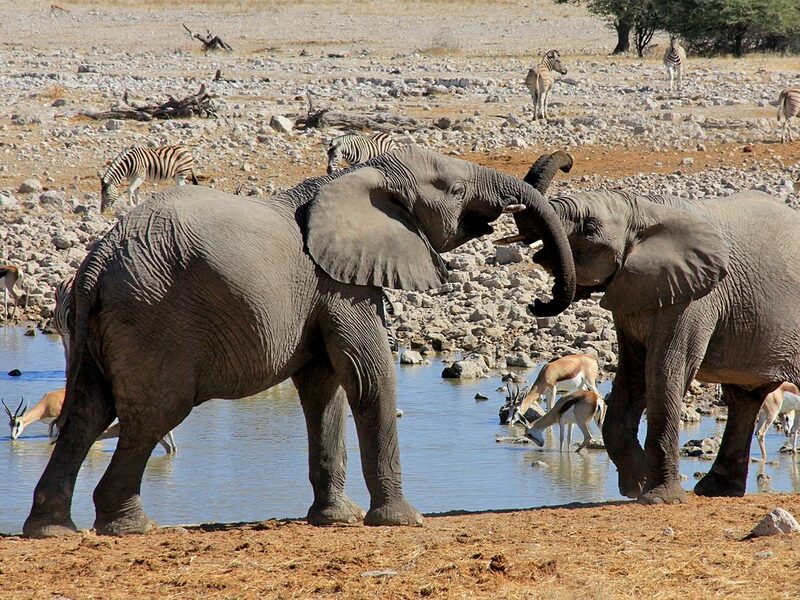 The next two days are set aside for game viewing in the Etosha National Park. You will spend most of your time close to the waterholes, where you can observe the animals and birds as they come to quench their thirst. In the dry months, these places are especially good for seeing elephant herds, zebras, giraffes, wildebeests, oryx, impalas, springboks and with a little bit of luck also lions, rhinos and leopards. You will stay one night at the Okaukuejo Camp. In the evening, you should take some time to visit the camp’s illuminated waterhole as park residents can be quite active here at night. The following day you will head to the western part of the national park, where you will overnight at the Dolomite Camp, beautifully nestled on an outcrop of dolomite rocks. At both camps you can take part in night game drives in search of nocturnal animals accompanied by a park ranger (optional). The camps in Etosha National Park are owned by the government. Although they are for the most part clean, you cannot call them luxurious. In the high season these camps are often booked out and then alternative accommodation outside the park will be booked. On your way out of the park you will enjoy some more game viewing. Be on the lookout for any animals you might have missed during the previous days. 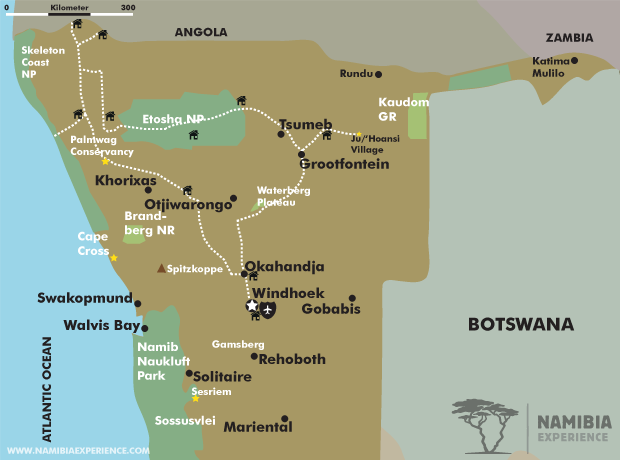 You will leave the Etosha National Park through the Galton Gate and continue in a northerly direction. You will pass Opuwo, the district capital of the Kunene Region and the gateway to the Kaokoland. A combination of tradition and modernity shapes this town and you will see many traditionally clothed Himba people as well as Herero women in their colourful garbs walking along the roads. You will then travel further through Epembe to the Kunene River Lodge, situated directly on the Kunene River, which forms the border between Namibia and Angola. This lodge is like an oasis after spending so much time in the aridness. In the late afternoon, you will take part in a boat cruise on the Kunene River, where you can search for more animals and birds. As the sun sets behind the mountains, watch as this idyllic landscape changes colour before disappearing into darkness. You will stay the night at Kunene River Lodge. After a leisurely breakfast with a beautiful view over the river, it is time to continue your journey. Your destination for the day is the Omarunga Lodge, also situated on the banks of the Kunene, but a bit more to the north and only a stone’s throw away from the Epupa Falls. Here, against a breathtaking backdrop, the Kunene River cascades down into a 60-meter-deep gorge – a spectacular sight to behold. Once you are at the lodge you have time to relax and enjoy your surroundings. If you would like to stretch your legs, you can always go for a stroll to the Epupa Falls. In the late afternoon, you will be taken to a nearby viewpoint, where you can enjoy the picturesque sunset and scenic landscape dotted with Makalani palms and Baobab trees. You will stay the night at Omarunga Lodge. In the morning, you will visit a Himba village, where you will not only learn more about the culture and traditions of these proud people, but also get an insight into their everyday lives. Most striking is the intense red colour of the women’s bodies. By using a paste of butter fat, ochre powder and wood ash, they dye their hair and protect their skin from the sun. You also cannot help but to admire their intricately braided hair and their gorgeous jewellery, made from iron, copper and shells. In the afternoon, you will join a walk along the Kunene River accompanied by a Himba guide. He will explain the different vegetation found in the region and you might even see a crocodile lounging in the sun. After about 2-3 hours you will head back to your lodge. You will stay another night at Omarunga Lodge. Let yourself be awakened by the gentle sounds of the Kunene… After a leisurely breakfast your journey takes you back to Opuwo and continues south along the Joubert Mountains and over the steep Joubert Pass. Your destination is the Fort Sestfontein. This old fortress was built in 1896 as an outpost to guard against poaching and weapons smuggling. It has now been converted to a comfortable lodge, where you will spend the night. Today calls for an early start as you embark on a journey through the Kaokoland. Enjoy the awe-inspiring and diverse landscape as you cross the sandy Hoanib River Valley and drive through shallow grassland and gravel desert. Always keep an eye out for wildlife as here you can find desert elephants, giraffes, lone oryx and zebras. Even lions can be seen from time to time in this inhospitable wilderness. A well-deserved shower awaits you back at the lodge to wash away the dust of the day. You will stay another night at Fort Sesfontein. You will leave early in the morning and make your way past Palmwag to the heart of the Damaraland. You will stop along the way to more closely inspect the Welwitschia plants, which grow here in abundance. Driving through Khorixas you will finally reach the Vingerklip Lodge. Sit back and enjoy the last rays of sunshine as your eyes glide over the picturesque valley with its flat top hills, known as the Ugab Terraces. You will have your evening meal and overnight stay at the Vingerklip Lodge. If you have not yet had the opportunity, you will visit the Vingerklip together with your guide in the morning. This remarkable 35-meter-high rock needle resembles a finger, hence the name ‘Finger Rock’. Hiking trails will take you up to the Vingerklip, offering great photo opportunities of the valley below. You will then continue to Okahandja. Take some time to browse through the well-known souvenir market, where you can find wood carvings, textiles and jewellery to name but a few. Just a short drive further and you will reach the Elegant Farmstead, situated in a private game reserve. Take a sunset drive (optional) or just relax and reflect on everything you have seen and experienced over the past days. In the evening, you will be treated to a typical Namibian farmer’s meal. After breakfast, you will head back to Windhoek. Depending on the rest of your travel plans, you will be taken directly to the airport or to a hotel of your choice. You will say farewell to your guide – totsiens – until next time. Note | Our guided safaris depart with a minimum of two and a maximum of six guests. A window seat for each guest is guaranteed. In order to design your own tailor-made safari through Namibia, please contact the Namibia-Experience team .